Personal case history of disabling Calcaneal Heel Spur Syndrome. I suffered with Heel Spur Syndrome/Plantar Fasciitis for almost two years. I tried not to limp in front of my patients while I treated myself with high and almost toxic dosages of anti-inflammatory meds. and cortisone injections. I realized that if I could not get more help than I was getting from injections, medication, and prescription orthotics, I would need surgery. If I tried to go without my orthotics, which often felt like they were providing little to no help, even for a couple of hours, things got terribly worse. I did not want surgery and I was not at all sure what I was going to do. Symptoms of Calcaneal Heel Spur Syndrome / Plantar Fasciitis. Chronic progressive history of pain described as being inside the bottom of the foot where the heel meets the arch. Less common variations present with pain in the retro-calcaneal area (back), medial (inside)), or lateral (outside) of the heel. Physical exam reveals pain with deep palpation of these same areas. X-rays, and relief following use of a temporary arch support (tape test) are important diagnostic. MRI and CT scans can be used to rule out other bone and soft tissue pathology, but are usually not required to make the diagnosis of Plantar Fasciitis / Heel Spur Syndrome. How do patients treat chronic arch and heel pain? Many patients will get relief just by decreasing their walking activity. Some get help with anti-inflammatory medications, and a new pair of shoes. Some get relief from judicious use of Prescription orthotics. Others suffer for years, before they finally walk and stand so infrequently that inactivity finally decreases the causative forces. Physicians use crutches, stretching, night splints, physical therapy, dietary supplements (Calcium, Glucosamine, Chondroiten), anti-inflammatory meds., athletic tape, pads, arch supports, custom orthotics injections, shock wave, cold laser, and surgery, all with either minimal, or temporary benefits. With disabling pain unresponsive to treatment, I had to invent Theta to stop my own Heel Pain. I realized that the orthotics were helping, but no where near enough. 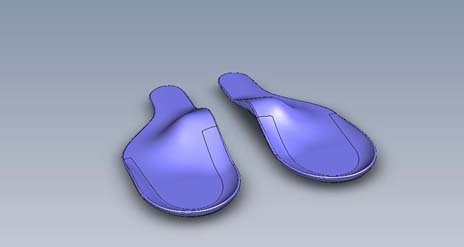 I had access to an orthotic lab and had been taught orthotic fabrication so I became the ORTHOTIST and began to make changes to the functional design of my orthotics. I was the DOCTOR specializing in the treatment of heel spur, trying to help my favorite patient (ME) avoid surgery, and walk without pain. My research background made me the Scientist intent on finding a better way to control foot function. Most importantly, I was now the PATIENT desperate to avoid surgery, stop the pain, and resume my normal walking activities. Once I became all four of these highly motivated individuals, It took me about two years to figure out how to get over 400 percent more help than I did with my prescription orthotics. It took another 3 years to quantify the process so that I could consistently do the same for all of my patients. In so doing, I resolved all of my heel pain, even though I actually increased my walking, standing, and running activity. Basically, I avoided heel spur surgery by discovering Theta Orthotics.